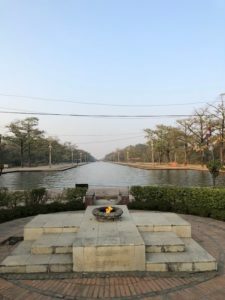 Lumbini is known as the birthplace of Gautam Buddha, and in today’s world it’s famous for its Garden of Buddhists Monuments. 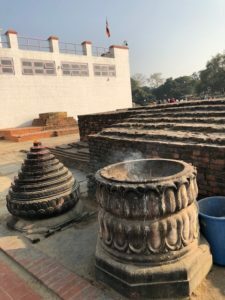 Having spent many years in Varanasi during my childhood, a trip to Sarnath was very often and that gave me some understanding of Buddhism. 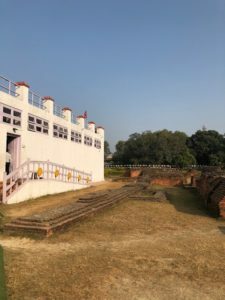 Then a year back I got a chance to explore KushiNagar another sacred site of Buddhism, and that led to further interest and curiosity in knowing more about shared culture and history of Lumbini. 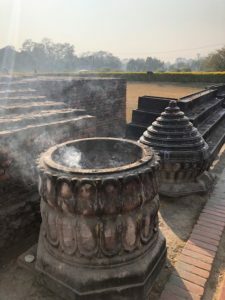 I was in India during winter break and we planned a day trip from Gorakhpur to Lumbini by road. 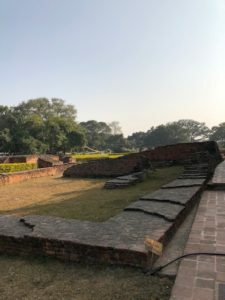 We also had thought of going upto Tansen, but later we cut our trip short to Lumbini only. 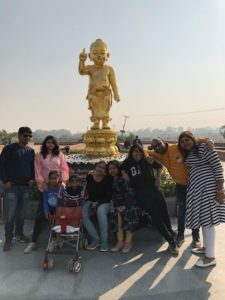 Since we have family at Gorakhpur, it’s always easy to start early in morning, and hence on 30th of December, we started at around 7 AM in the morning, in two SUVs, some 12 family members, including kids. 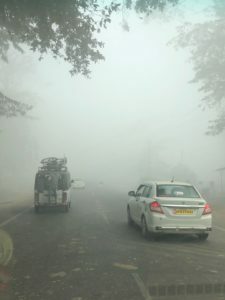 It was a very foggy morning and visibility was very poor, so we drove slowly although traffic was not bad. 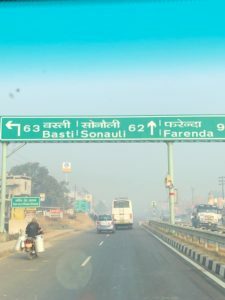 Our first stop was Nautanwa, a border town just before Sunauli border, where my sister in law lives. We stayed there for an hour and after breakfast we further proceeded towards border crossing. 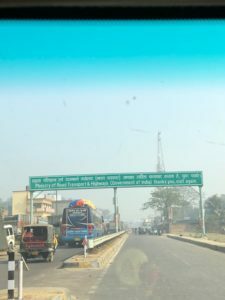 It was around 10:30 AM when we reached Sunauli border with long queue of Trucks and buses all waiting for completing the paperwork to cross that side of border. 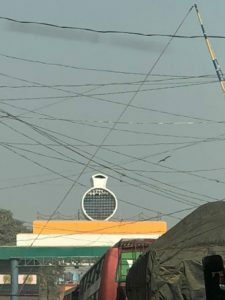 Chaos, cacophony and crowded can be only few words to describe what it was, but as always, system works and delivers huge crowds and hundreds of cars, trucks, buses cross the border every hour. 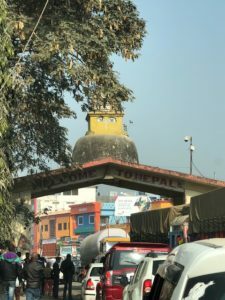 As you complete the Bhansar (Nepal Custom Formalities) and cross the border, you will find much better managed arrangements on another side of border. 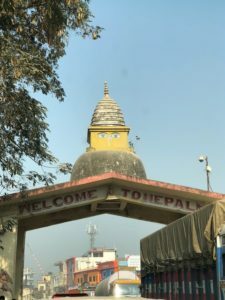 Difference is very clear, Bhairahawa the border town on Nepal side is much bigger and much better organized than Sunauli, the border town on Indian side. 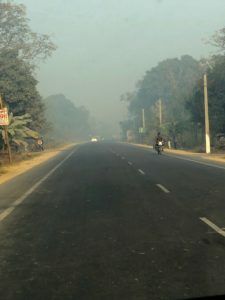 From Bhairahawa, Lumbini is another 25 kilometers of drive by road, but the roads are really in bad shape. Lot of construction is happening along the way resulting in many diversions, and single lane roads. 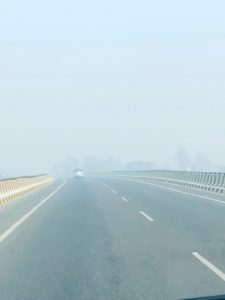 But the good part was we did not see much traffic on that day and within 45 minutes we reached Lumbini. 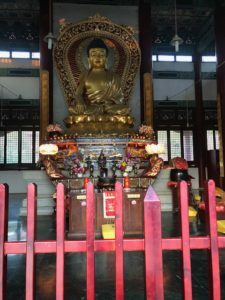 UNESCO designated this birthplace of Buddha as World Heritage Site. 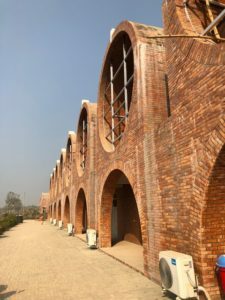 This heritage site is around 5 kilometers in length and 1.5 kilometers in width, with multiple gates on every side of the complex to control the vehicle traffic and parking. 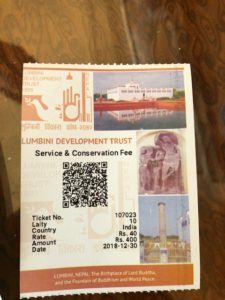 Before entering in the heritage complex, you need to buy entry tickets from Lumbini Museum which is outside the Heritage complex. 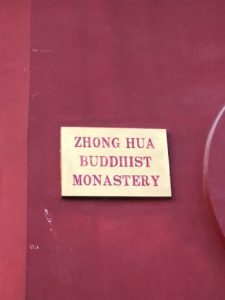 This holy site is bordered by Monastic zone, which means only monasteries will be built inside the complex, and no shops, restaurants and any other commercial establishment is allowed. 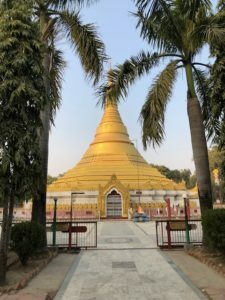 We entered from gate 3, and parked our cars in the parking next to the Myanmar golden temple. 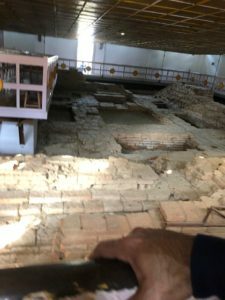 From there we walked towards the main complex, where there is a water canal that separates eastern and western monatic zones. There is a motor boat service in the canal which ferries all the tourists to another end of canal. Charges are Rs 50 for Indian nationals. 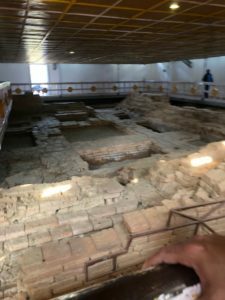 we decided to do boating after visiting the Maya Devi Temple. 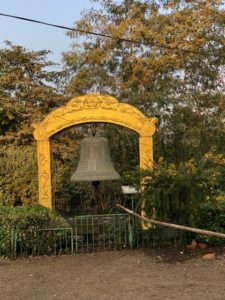 May Devi Temple is the most important attraction in this heritage site, known as the where Queen Maya Devi gave birth to Buddha. 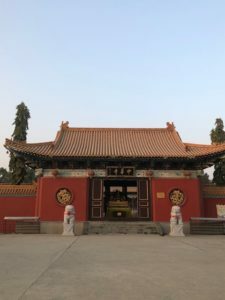 Its a white color temple built around the exact spot Buddha was born. 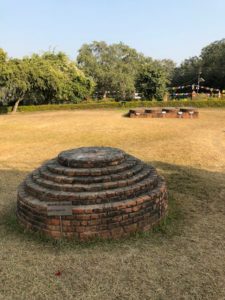 Next to the temple in the garden you can see the ruins of various stupas and monasteries built over thousands of years. 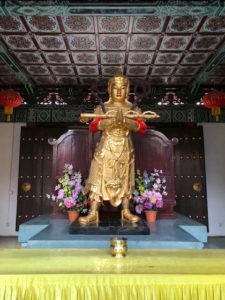 There is sacred Bodhi Tree and a sacred pond with their own historical facts and myths around them. 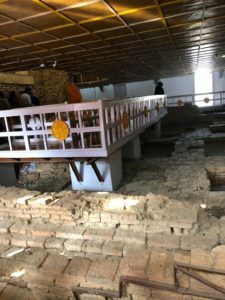 Inside the temple you can walk around ancient ruins on a raised boardwalk. 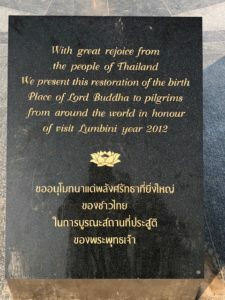 Taking pictures near the sacred place where Buddha was born is not allowed. 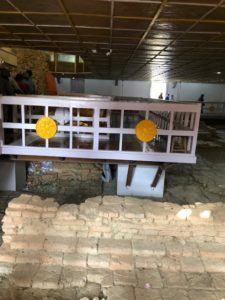 You will also notice hundreds and thousands of currency notes of different countries thrown by devotees as part of their homage to this site. 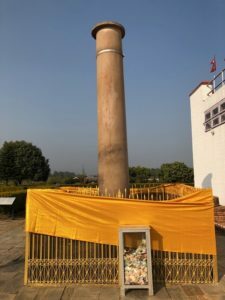 Ashokan Pillar is one of the major attraction in this heritage park. 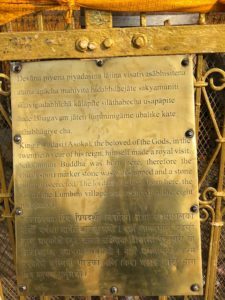 It is believed to be built 249 BC, when Emperor Ashoka visited Lumbini. 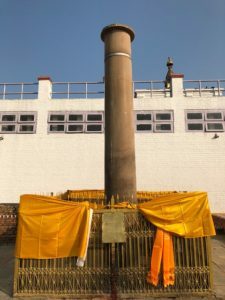 This pillar is surrounded by small fence with decorative flags, and very close to this pillar you have various bowl shaped structures to light incense sticks for prayers and meditation. 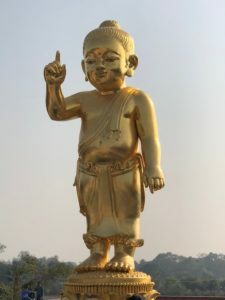 The Myanmar Golden Temple is one of the oldest temple in the Heritage complex. 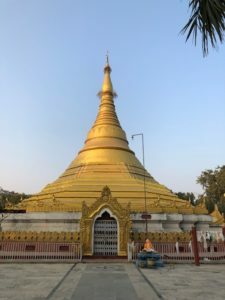 With its golden tomb and corncob shaped shikhara, its typical Burmese temple that you will find all over eastern countries. 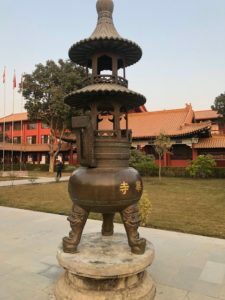 China Temple or Zhong Hua Buddhist Monastery as it is widely known is a huge temple with multiple prayer halls, long corridors, meditation halls and pagodas. 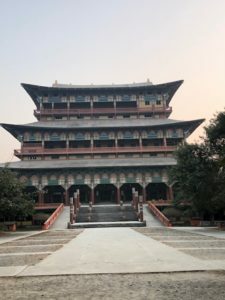 By the time we reached there, it was evening and the prayer halls were getting closed, so we could not spend much time there. 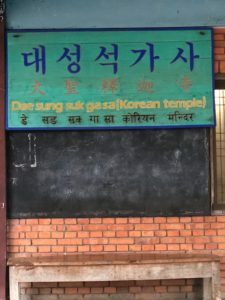 We reached this beautiful Korean temple at almost 5:30 PM, when it was getting closed. 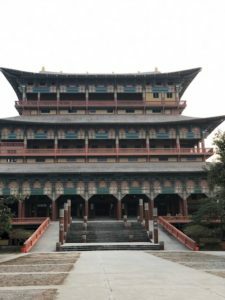 Just from outside itself, this magnificent temple is a sign of calm and peace. 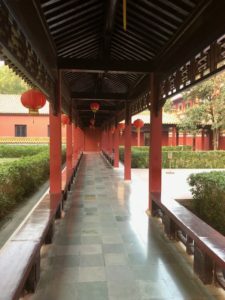 Inside gated compound and multiple stairs to reach the main temple. 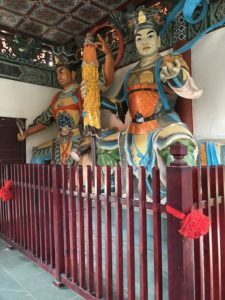 Its located just across the road from Chinese temple. 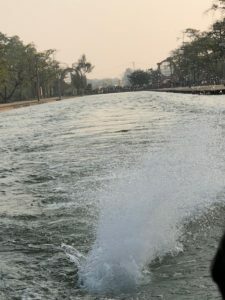 While we went around looking at temples and monasteries, we also spent some time taking the boat ride in the canal. These boats start very close to the place where Eternal Peace Flame is. 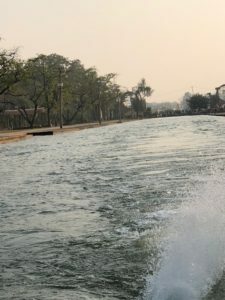 The canal is not very deep and with just 5 feets of water, it is more of a waterway built to provide some recreation time to the tourists. 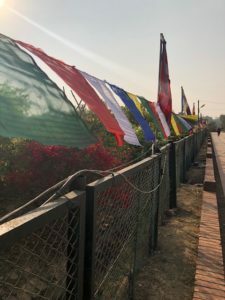 They have multiple boats there with a capacity of 20-25 people per boat that takes them from easter side to western side of complex where the World Peace Pagoda is. 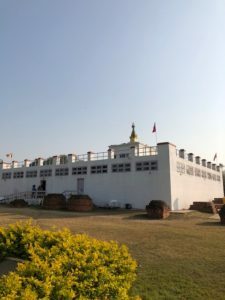 Its beautiful white stupa that you can see from the other end of canal. 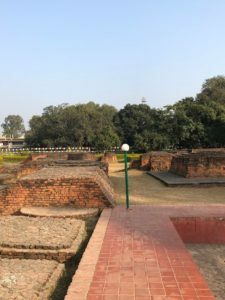 After spending almost 6 hours in Lumbini Heritage site, all the kids were getting impatient and hungry and that is when we decided to call it a day, and came outside to look for some good restaurants for food. 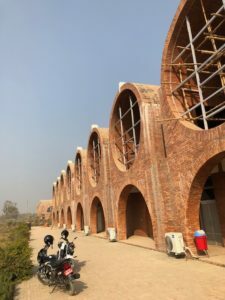 As we came back to main city of Lumbini there were lot of small restaurants and hotels and we spent some time for snacks before we started driving back to Bhairahawa. 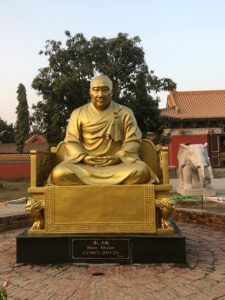 Out of all the main temples in Lumbini we missed the Thai temple, which is also said to be very beautiful. We reached Bhairahawa-Sunauli border at around 8 PM, and again it was very crowded and chaotic. 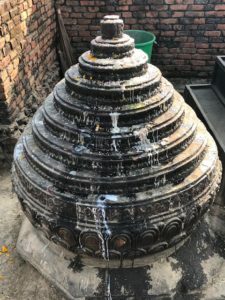 But that is how the life is on both sides of international border, with so much trade, tourism, shared culture and heritage between people of India and Nepal. 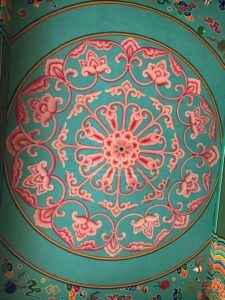 I hope I will be back here again, and get more time to visit this beautiful country and explore some more history and culture. 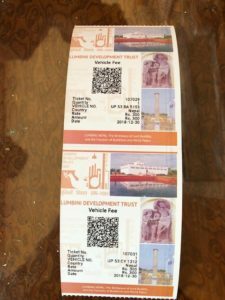 🙂 You make Lumbini looks more special, thank you for visiting our city.